Personalised wedding invitations, decorated with a Christmas baubles design. Perfect for winter weddings! 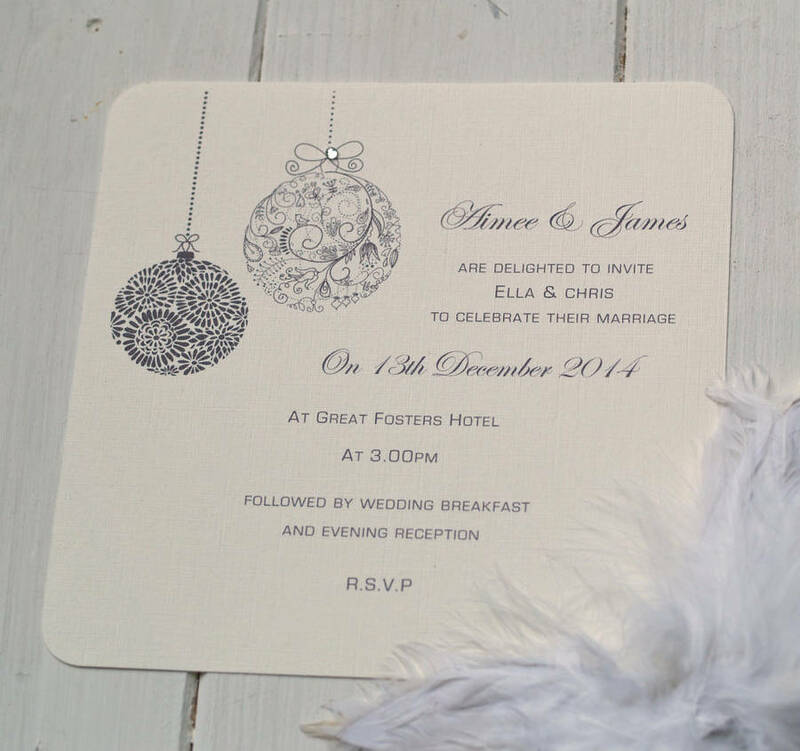 These gorgeous personalised invitations are printed in dark grey text and design. 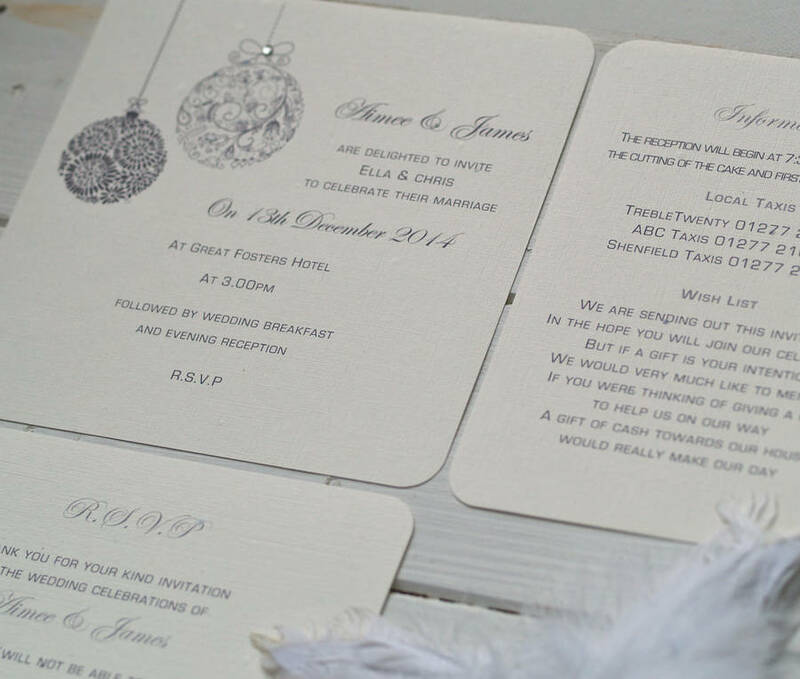 Optional extra's include RSVP cards, thank you cards and insert cards, and little decorative gems, you can also have the invites personalised with guest names, these options are all available from the drop down menu. Printed on a silkyweave textured ivory 250gsm card. Ivory gummed envelopes are included. Also perfect for engagement, anniversary and birthday parties. PLEASE NOTE: MINIMUM ORDER 30 INVITATIONS - THIS CAN INCLUDE DAY AND EVENING INVITES EVEN IF ADDED TO YOUR BASKET SEPARATELY. May also be decorated with crystal gems, optional, please select from the drop down menu. Please send your personalisation wording when placing the order, if you do not have the details ready please leave us a message that this will follow. 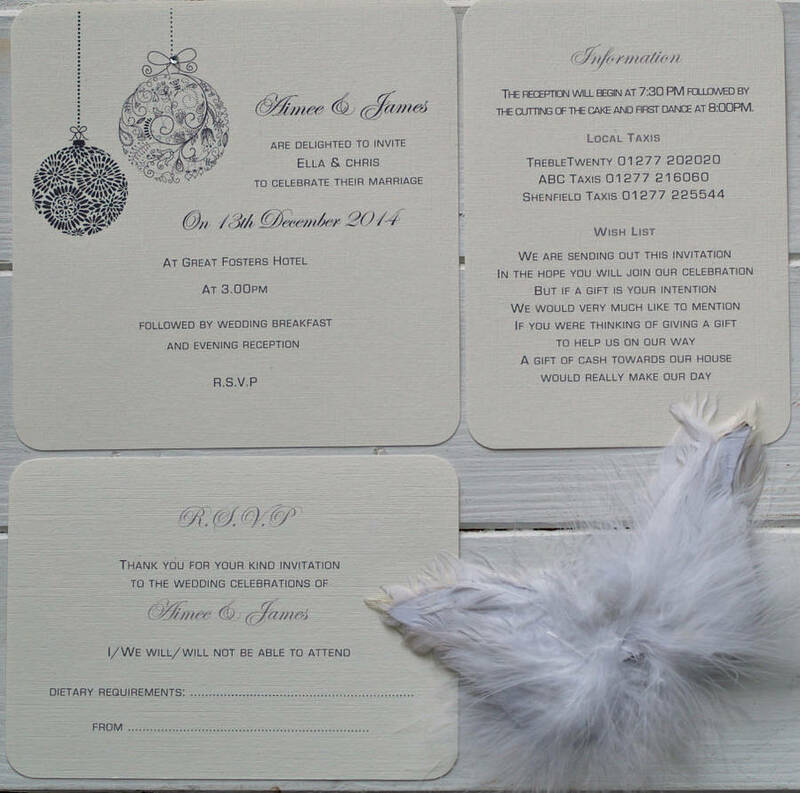 This design can be personalised for day and evening invitations. 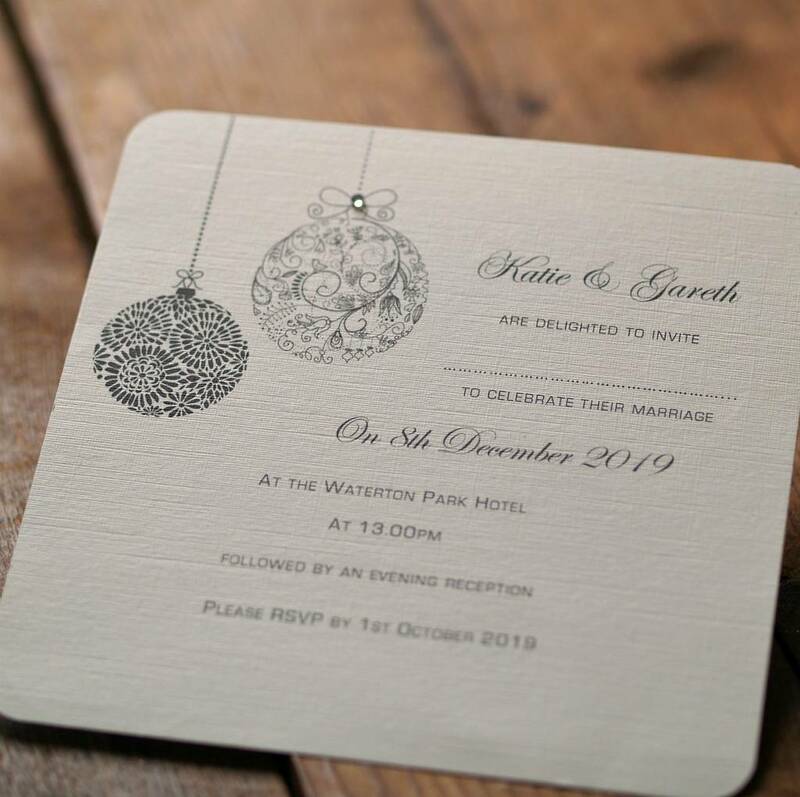 If you require both types of invitation, they can be put on the same order by adding day invites to the basket then returning to page and adding evening invites to basket then going to checkout. A Jpeg file will be sent to you within 2-3 days, for you to check the ALL is correct. (Full approval is required for printing). This gives you the opportunity to make any last minute changes to the wording and correct errors if needed. Once approved, your finished stationery will be delivered within 7-10 days depends on the job is involved. Please note, once artwork is approved and printed, no changes can be made or refunds given due to customisation of the products. Regrettably due to time constraints and costs, I am unable to send free samples. You can purchase a single card as a sample, unfortunately for the same reasons this cannot be personalised. Printed on a silkyweave textured ivory 255gsm card. Ivory square gummed envelopes included.